Felicity Heaton’s Eternal Mates Series Special Four Cover Reveal!!! 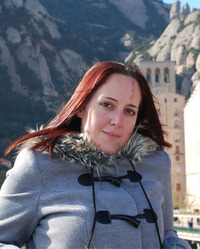 Felicity Heaton has a cover reveal with a difference this time. She’s revealing the covers for the next FOUR books in her Eternal Mates paranormal romance series at once. These novels will all be coming out between January 6th and March 10th next year, and every single of one of them are shape-shifter romances. Back to the reveal… here are the covers for the next four books in the series and more about them. 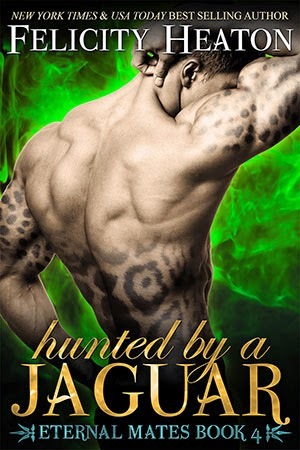 A jaguar shifter with a dark secret, Kyter has spent his entire life running from his demons. When a tragedy takes him back to his pride’s village, he is set on a path of vengeance that will see him collide with the terrible ghosts of his past and a beautiful vision of his future. Iolanthe deals in finding artefacts for discerning clients, but this time her client is one of the deadliest men in Hell and her mission has the highest stakes imaginable. Failure is not an option when your life is on the line, but things take a dangerous turn when she crosses paths with a handsome and mysterious male on the hunt for the same artefact—a male who declares she is his eternal mate. Can Iolanthe resist Kyter’s wicked allure and find the artefact before he does? Can Kyter face his demons and win the heart of his fated female? Or will this deadly game of cat and mouse claim both of their lives? Hunted by a Jaguar is due for release in ebook and paperback on January 6th 2015 and will be available from all major online book retailers. Having turned his back on his snow leopard pride, Cavanaugh has been counting the days until he’s free of a role he never wanted—one that separated him from his fated female and stands between him and the future he craves with her. Just days from the night he will finally be free to be with the low-ranking beauty who stole his heart, she walks back into his life and threatens to destroy everything he’s worked towards in the five long years they’ve been apart. Eloise has travelled across continents searching for the male who was once her best friend and so much more to her, but was now her pride’s true alpha. Desperate to fulfil a promise to her kin to save them from the tyrant he left in charge, she convinces Cavanaugh to return to his pride, but as they journey to Bhutan, doubts bloom and old feelings resurface, tearing her between duty and her deepest desires and impossible dreams. Will Eloise be able to resist the burning need that Cavanaugh reignites in her and remember her place in the pride? And can Cavanaugh find a way to save his kin and claim the future he craves with the woman he loves? Craved by an Alpha is due for release in ebook and paperback on January 27th 2015 and will be available from all major online book retailers. The sole remaining member of the most famous shifter hunter family in history, Owen Nightingale is a mercenary and a man with a secret held in his closely guarded heart, but when a beautiful a rare shifter catches his eye and offers him a job, he has the feeling he’ll be the one paying for helping her—with his heart. Cait is in a spot of trouble with a capital T. A male hellcat has set his sights on claiming her and she’s one kitty who doesn’t want a collar, and who has spent her life avoiding relationship and is intent on remaining free. When she meets a dark, alluring and mysterious hunter, she sees a chance to rid herself of the male, but the price Owen sets and the fierce passion that burns white-hot between them lures her dangerously under his seductive spell. Can Owen discover the true intent of the male hellcat and stop Cait from falling into his hands? And can Cait retain control as the heat of desire burns between her and Owen, or will a reckless moment seal both of their fates forever? Bitten by a Hellcat is due for release in ebook and paperback on February 17th 2015 and will be available from all major online book retailers. Possessed by a need to save a beautiful Amazon warrior from the vision he witnessed, Loke snatched her from the midst of the battle between the Third and Fifth realm of the demons, and carried her to his home deep in the black mountains of Hell to protect her. But as the fierce little female awakens, he finds she’s anything but grateful, and his dragon instincts roar to life to warn she might be more to him than an enemy—she might be his fated female. Anais remembers meeting a handsome warrior in the heat of battle, a man who was her enemy but who looked at her with eyes that held dark heat and wicked promises. When she wakes to find that same dragon shifter has taken her captive, desire is the last thing on her mind, but escaping him to return to Archangel, the hunter organisation she works for, sounds less than appealing when he reveals the reason he took her—to stop her from dying. Can Loke protect Anais from the dangers of his realm and how far will he go to save her from the future he keeps witnessing? Can Anais resist the fierce attraction that burns between them as hot as fire and stay true to Archangel or will her heart be taken by the dragon? Taken by a Dragon is due for release in ebook and paperback on March 10th 2015 and will be available from all major online book retailers.